When you exercise, the hope is usually that it will make you feel better in the long run — that it will keep your heart healthy, keep weight off, provide a fun challenge, and even contribute to your social life. That's why it's so frustrating when sports-related injuries slow us down. Not only do injuries cause us pain and inconvenience, but they also prevent us from living our lives to the fullest. Luckily, there are ways to minimize your chance of injury — and ways to recover if you've already sustained one while exercising. Let's take a look at some of the most common injuries, what sports they're associated with, and some prevention and treatment options. When it comes to preventing sports injuries, common sense guidelines prevail: always stretch and warm up muscles before exercising, never push your body past its limits, and eat nutritious food to keep your body in tip-top shape. But let's take a look at some specific (and common) sports injuries — and some tips on prevention. If you're an avid runner, you might encounter shin splints at some point. Caused by small tears in your muscle, shin splints are considered an overuse injury, meaning those who run frequently are more prone to experience this painful injury. However, shin splints are also common for beginning runners who haven't developed the proper muscles. In addition, if you play sports like basketball that requires a lot of force to be put on your legs, you're at risk for shin splints as well. When you have shin splints, you'll experience the tell-tale pain near your shinbone (tibia.) Usually, the pain begins when you start exercising, intensifies throughout your workout. In some cases, the pain will persist even past the point of exercising. If you're suffering from shin splints, it's important to stop running so that you can reduce the inflammation in your leg and prevent further injury. Prevention Tip: It's important to wear supportive running shoes that help maintain good form. Also, be sure to warm up and stretch before running, and keep a gradual pace if you're a beginner. Also known as "pulling a muscle," a muscle strain occurs when the individual fibres that make up a muscle get stretched too far. Although strains can vary quite a bit in intensity, they usually cause pain and inflammation in the injured muscle. With more serious strains, you might have a bruise over the place of the injury, and you may be unable to use the muscles in that area. In the worst cases, you might also recall hearing a "popping" sound as you pushed your muscle too far. If you suspect you've strained or pulled a muscle, immediately discontinue exercising so that you don't cause more damage to the area. Though some strains might heal in a few days, serious strains will require a trip to your physician. Prevention Tip: Muscles can tear if they're stretched too far, or if too much force is placed on them. So make sure that you pace yourself when exercising, and always warm up your muscles before you perform any strenuous activities. Similar to a strain, a sprain occurs when your ligaments — tough bands of connective tissue that stabilize joints — are stretched or torn. One of the most common of these is an ankle sprain which is especially common in activities like soccer, where you're turning and twisting rapidly. Though they're common in the ankle, you can also experience sprains around your other joints, like your thumb, wrist, and knee. Like strains, you'll experience pain and inflammation around the affected joint. Depending on the severity of the sprain, you may have difficulty moving the affected area. Though mild sprains will usually heal themselves at home, it's important to see a physician for a severe sprain and to discontinue activity on the affected joint. Prevention Tip: Sprains often happen due to a misstep or a fall, so exercise caution when exercising outside in slick conditions. Consider seeing an expert, like a physiotherapist, to learn which exercises will help strengthen and stabilize the muscles around joints. Tennis and golfer's elbow are both repetitive use injuries. When participating in sports that make use of your arms, like tennis, golf, or racket sports, the repeated motion can irritate your tendons. As the tendons become irritated and inflamed, you'll feel pain and inflammation in the elbow. Tennis elbow symptoms are generally felt on the outside or lateral side of the elbow. As a result, you'll feel pain while playing tennis — and you also might feel pain while doing everyday activities like twisting jars open or gripping items. Golfer's elbow is similarly caused by inflammation of the tendons and muscles in your arm but manifests inside on the inside of your elbow. Prevention Tip: If you play a lot of tennis or golf, just make sure that you're stretching the muscles of your wrist and arm before playing. When you start to feel irritation or inflammation in that area (as opposed to ordinary muscle soreness), it's a good idea to rest and avoid the activity for a while. If the pain continues, make sure you see a physician. Runner's knee. Also known as patellofemoral pain syndrome, this injury commonly affects runners. The most common sign is a pain in the front of your knee that may intensify as you're going downstairs or running downhill. It can be caused by overuse, like running, squatting, or going up and down stairs more frequently than usual. It can also be caused by mistracking of your patella, which means that your patella (knee bone) isn't aligned properly. This can also be exacerbated by worn cartilage around the knee joint, and knees that turn inwards or outwards excessively. Torn ACL. Your knee is stabilized by several ligaments, all of which are vulnerable to stretching or tearing in contact sports like soccer or basketball. When the anterior cruciate ligament (ACL) tears, you may hear a "popping" noise, and be unable to support yourself on your knee. You will experience pain and swelling, and will probably lose range of motion in your knee. With a suspected ACL tear, it's important to seek medical intention. In some cases, it might require surgery. Prevention Tip: To prevent runner's knee, make sure that you are strengthening muscles that help keep your patella aligned, such as your quadriceps muscle. To prevent an ACL tear, be especially careful in motions that require quick turning or torquing motions. You will need physiotherapy to regain proper use of your knee following treatment for an ACL tear. Rest - Stop the activity you're doing, and get to a place where you can rest the injured part. Ice - Apply an ice pack to the area. You can do it for up to 20 minutes at a time, every 2 to 3 hours. Compression - Apply a bandage for rm but gentle compression. Elevation - Elevate the injured limb. Once you've gotten yourself off your feet and you're working on the RICE method, you might want to reach out to a professional to help you manage your injury and get back on track. If you have a serious injury or think you may have fractured a bone, seek medical attention immediately. Rehabilitation. 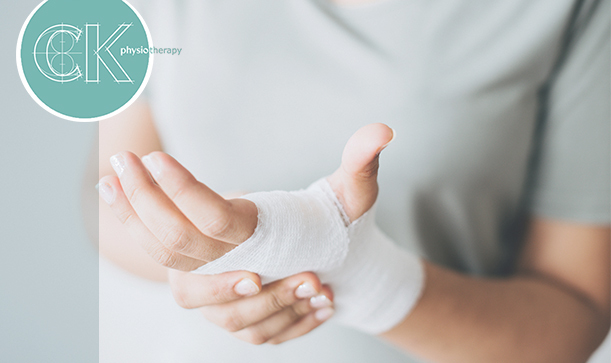 Using soft tissue manipulation like massage, physiotherapists can promote healing and facilitate blood ow to the area. Using specialized techniques, they can help loosen restricted muscles that cause additional pain. As you heal, they'll help provide you with stretches and exercises that will help you return to former, regular usage. Strengthening. If you want to take your sports practice to the next level, a physiotherapist can help promote overall well-being and proper functioning of your muscles and joints. Working with your sports goals, they can help you isolate and strengthen muscles that will improve your practice. Maintenance. By analyzing your gait and form, physiotherapists can make sure that you're following good practices when you exercise. Using their expertise, they'll help you maintain your muscles, tendons, and ligaments and reduce the risk of overuse injuries. At CK Physio, our professionally-trained physiotherapist team will work with you on your fitness and exercising goals. We can help guide you in your rehabilitation process - and help you thrive at your favourite sport or activity. If you want to get started, please contact us today.